Aerial, mountable, handheld and wearable: PITTA, now raising funds on Kickstarter, appears to be a camera that can do it all. Built around a modular design, PITTA (no relation to the bread) uses a twist-and-lock system, as well as magnets to convert between its several different modes. Small and light, PITTA weighs just 200g (about the same as your phone). This makes it light enough to squeeze under the legal requirement for registration in the United States – all drones weighing more than 250g must be registered with the Federal Aviation Authority – although rules in other countries will, of course, differ. It measures 170mm across (excluding propellers) and its wings are foldable for portability. The unit's 13MP camera, meanwhile, is entirely contained within the protective housing. Snap on the magnetic drone module and the PITTA camera is equipped for flight. 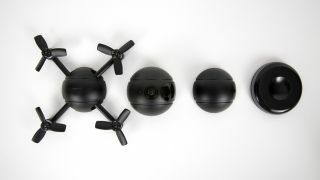 As a drone, it features with a number of flight modes, including auto-follow, terrain-aware, orbit and return home, and you can also instruct it to shoot a 360-degree panorama. The drone is rated for 15 minutes of flight time, and will alert the user when power levels run low. And, as we would expect, flight is controlled via the mobile app. As an action camera, PITTA can be used handheld or mounted onto any standard action camera mount via the action camera module. It features burst shooting, 60fps slow-motion video and time-lapse functionality. Users can also share their shots and videos easily to social media, and even livestream video. As a nifty bonus, PITTA can also be used as a home security camera. When it’s docked in its charging cradle, it’s still capable of streaming video straight to your phone, which means that you can use it to keep an eye on the house, or on your pets, while you’re away. PITTA is raising funds on Kickstarter now, and will be doing so until February 3rd. The minimum pledge required to get your hands on one is $289 (about £213), and the makers expect the product to ship worldwide in April 2018. Head to Kickstarter to secure yours before the funding period ends.